Pop superstar Elton John, whose music has delighted generations of fans, embarks on his final tour. 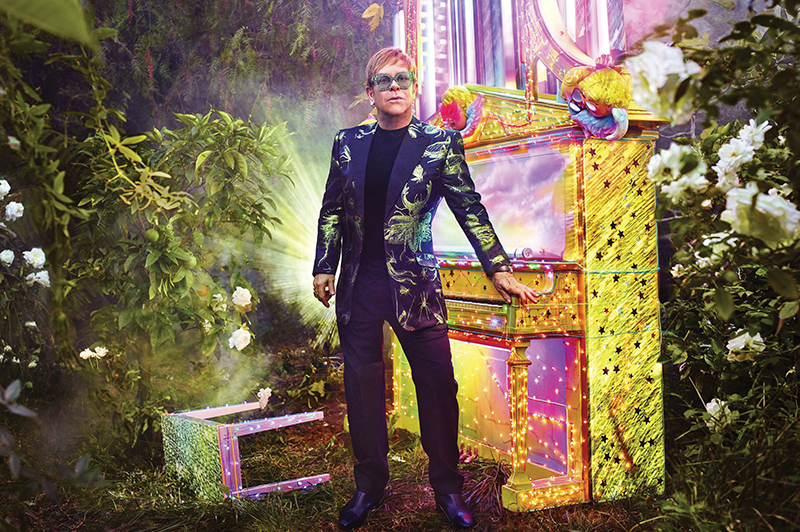 If you’ve never seen Sir Elton live, check him out on December 6 at the Smoothie King Center for what promises to be a memorable night. SmoothieKingCenter.com. From December 1-30, Lafreniere Park in Metairie hosts a beautiful light display with a 60-foot sea serpent in its lagoon, a castle, gingerbread man, Saints players, a Lombardi Trophy and much more. There’s also a carousel for kids at $1 per ride. Entrance is $5 per vehicle; it’s free on Christmas Day and Christmas Eve. VisitJeffersonParish.com. On December 7, the historic Joy Theater will be screening the cult classic comedy Napoleon Dynamite. As a bonus for fans, the film’s star, Jon Heder, will be in attendance and engage the audience in a conversation and Q&A after the movie. TheJoyTheater.com. A down-on-his luck aspiring actor takes a job as an elf at Macy’s during Christmas season. There, he must contend with aggressive parents, drunken Santas, flirtatious actors, and more in this irreverent adaptation of David Sedaris’ popular non-fiction story. The play, for mature audiences, runs from November 30 to December 23 at Teatro Wego in Westwego. jpas.org. Celebration in the Oaks, City Park. NewOrleansCityPark.com. On Your Feet! Saenger Theater. SaengerNOLA.com. Mandatory Merriment: An Untitled Holiday Musical, Southern Rep Theater. SouthernRep.com. Christmas Belles Are Ringing, Stage Door Canteen. NationalWW2Museum.org. The Original Harlem Globetrotters, Smoothie King Center. SmoothieKingCenter.com. Damian Rice, Orpheum Theater. OrpheumNOLA.com. Peppa Pig Live! Saenger Theater. SaengerNOLA.com. LUNA Fete, Lafayette Square. ArtsNewOrleans.org. AllState Sugar Bowl LHSAA Prep Classic, Mercedes-Benz Superdome. MBSuperdome.com. A Christmas Carol, Le Petit Theatre. LePetitTheatre.com. Sesame Street Live: Let’s Party!, UNO Lakefront Arena. arena.uno.edu. Holiday Spectacular Featuring the 610 Stompers, Mahalia Jackson Theater. MahaliaJacksonTheater.com. New Orleans Running of the Santas, Mannings & Generations Hall. RunningOfTheSantas.com. Canal Place Reindeer Run & Romp and Holiday Scavenger Hunt, Canal Street. DowntownNOLA.com. Teddy Bear Tea, Stage Door Canteen. NationalWW2Museum.org. Cole Swindell & Dustin Lynch, Champions Square. Champions-Square.com. A John Waters Christmas, Civic Theatre. CivicNOLA.com. Mannheim Steamroller Christmas by Chip Davis, Saenger Theater. SaengerNOLA.com. An Evening With Harry Connick, Jr., UNO Lakefront Arena. arena.uno.edu. R + L Carriers New Orleans Bowl, Mercedes-Benz Superdome. NewOrleansBowl.org. New Orleans Ballet Theatre – Nutcracker, Orpheum Theater. OrpheumNOLA.com. Caroling in Jackson Square, Jackson Square. ExperienceNewOrleans.com. Elf: The Musical, Saenger Theater. SaengerNOLA.com. Trans-Siberian Orchestra, Smoothie King Center. SmoothieKingCenter.com. NOLA Christmas Fest, Ernest N. Morial Convention Center. NOLAChristmasFest.com. The Nutcracker, Mahalia Jackson Theater. MahaliaJacksonTheater.com. Shen Yun, Mahalia Jackson Theater. MahaliaJacksonTheater.com. Moscow Ballet’s Great Russian Nutcracker, Saenger Theater. SaengerNOLA.com.